Ringr App Offer free calling over the internet and wifi connection. With this app you can call your friends and family at no cost. You just need an active connection for that. Not only that you will earn hourglasses and minutes in the app with your free calling. Ringr Comes with their reward program in which you can earn Free Paytm Vouchers and amazon, flipkart Gift Vouchers. It doesn’t end here you can also win woohoo gift vouchers through which you can buy gift cards of your own choice. there is a Ringer Refer and Earn Program which would help you to extra hourglasses and minutes. which you redeem for free paytm cash and Giftcards. 2. Signup using your Mobile No. 3. Verification OTP will be come on your mobile no. for Ringer account Verification. 4. In Next step Choose your location and Gender. 5. Your account is Created Now. 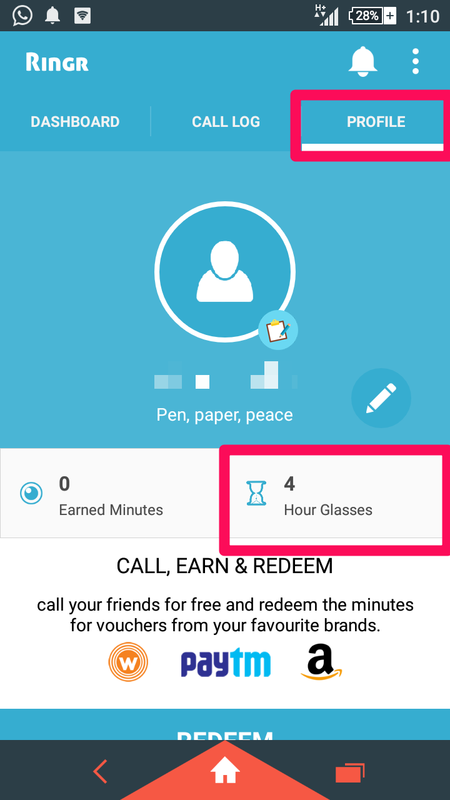 You will need both Hourglasses and Minutes in the app to redeem these free vouchers in Ringr app. You can earn additional Hourglasses and Minutes by doing simple tasks in the app. 1. By Call your friends and family from Ringr app you will get those minutes. 2. 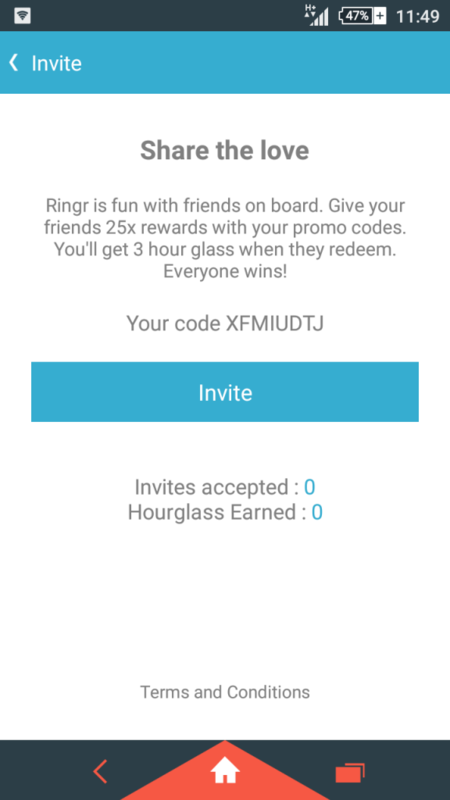 Completing Surveys in Ringer app to earn 2 Hourglasses. 3. Watch video on Ringr app to get 2 Hour glasses. 1. Go to Profile and Click on Hourglasses as in screenshot. 2. In Next step you will find Invite option. For every 5 friends who uses you referral code will get you 2500 minutes and 3 hourglasses. Which can be redeemed against Rs 25 Paytm cash and more can be earned for next rewards. 1. You can earn maximum of 50,000 points and 60 hourglass from the Ringr refer and earn offer. 2. This Ringr app offer is valid till 8 August 2015. 4. Your minutes will expire in 3 months of their credit. 17 Responses to "Ringr App Offer : Free Paytm Cash and Gift Cards"
I reedem 50 rs from ringar app with paytm.. it says amount wil be credited within 24 hours.. I wanted to know that how much time needed for transfer? used refaral code and shown ‘you got 25x’but points/minutes shown 000. and my friend also used my code but shown same problem..have any solution admin???? Plz send me coupon code…..
abhishek by using referral code you will get 25 X referral reward means You make 1 minute call you will 25 minutes b by using reerral code you will get 625 minutes its a little annoying proceed if you had patience with this offer.